This is a fine example of Thomas Cowperthwait and S. A. Mitchell's 1849 map of Kingdom of Sardinia. 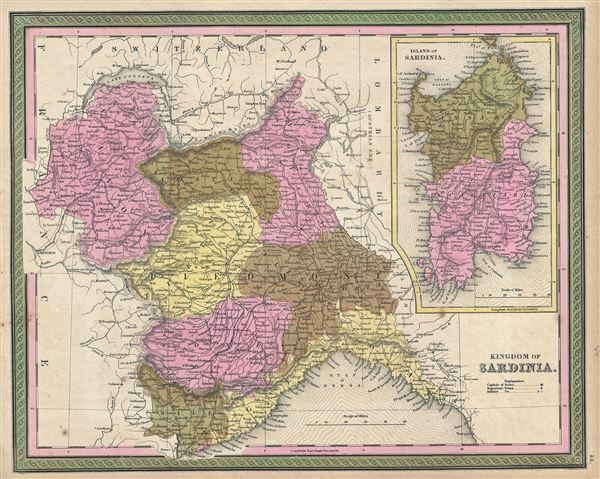 Centered in Piedmont, this map covers the Kingdom of Sardinia's claims both on the Island of Sardinia and the mainland provinces of Piedmont, Savoy, Aosta, Coni, Nice, and Genoa. The whole is engraved in Mitchell's distinctive style with green border work and vivid pastels. Political and topographical features are noted and color coded with elevation rendered by hachure. The Kingdom of Sardinia or Piedmont-Sardinia was ruled by the House of Savoy since 1720, barring a short period when the mainland domains were annexed by Napoleonic France. The Congress of Vienna however returned these territories to the House of Savoy in 1814 with the inclusion of Genoa. In 1848, just a year before this map was made, King Charles Albert proposed a new constitution, which would eventually become the constitution of the unified Kingdom of Italy in 1861. The region would also be on the brink of the Crimean War (1853 – 1856), a conflict between the Kingdom of Sardinia along with the allied forces of the British, French and Ottoman Empires against the Russian Empire. This map was prepared by S. A. Mitchell for publication by the Philadelphia firm of Thomas Cowperthwait & Co. as plate no. 55 in the 1849 edition of Mitchell's New General Atlas. Rumsey 0545.059. Phillips (Atlases) 797.